Explore the mysterious world of the Snow Globe: Farm World. Grow sheep, collect products, organize work in a workshop, run a pillow factory and as a result of all your hard work the two lovers will finally reunite. Take good care of your domestic animals and be aware of the dangerous predators trying to destroy your farm. Every level is one more step towards love. 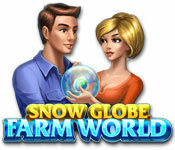 There is no challenge you can’t handle in theSnow Globe: Farm World!